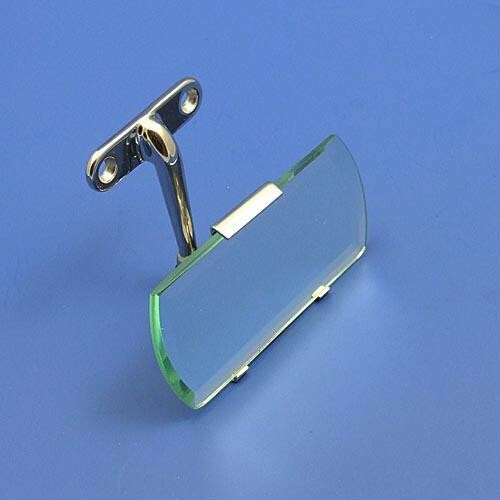 quarterlight glass type clamp on stainless steel mirror. 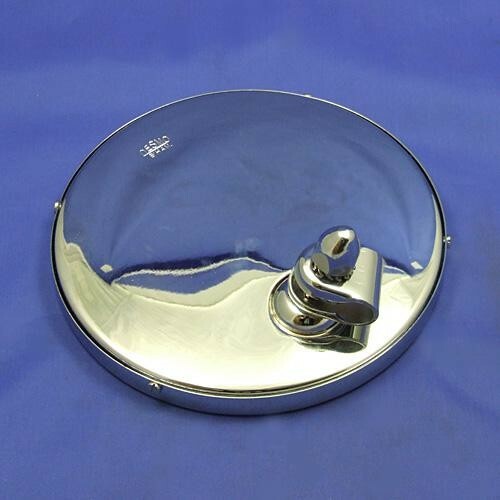 convex glass 115mm x 73mm with stainless steel back and bracket. 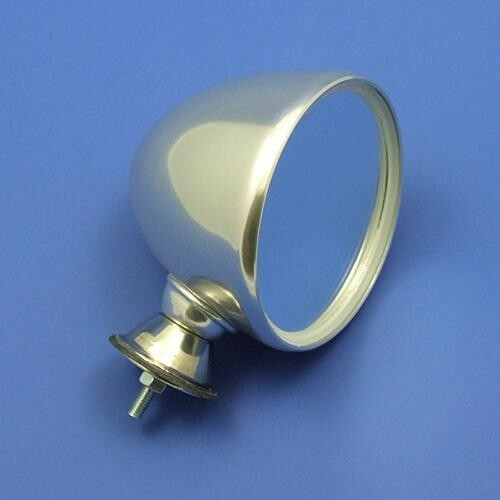 two screws nip the assembly to the edge of the opening quarterlight, to suit the left hand side the stainless steel bracket will require re-bending slightly. 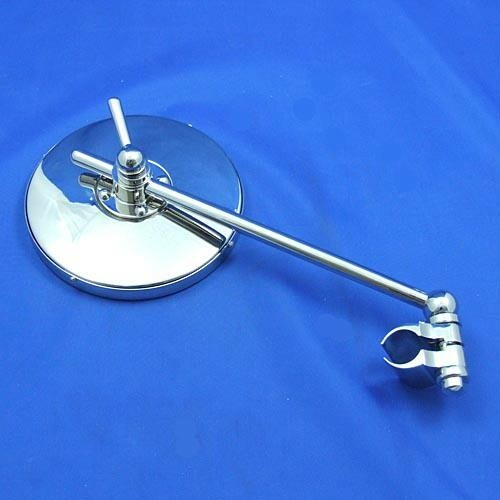 dash mirror on adjustable height stem, two screw swivel type base 58mm x 25mm (slotted hole centres approx 37mm to 43mm apart) . 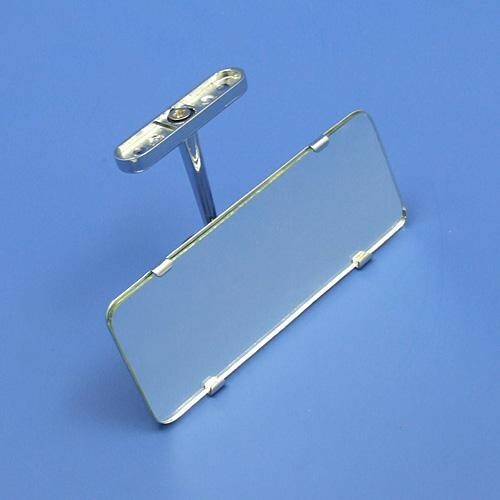 metal backed flat glass 105mm x 45mm, stem height adjusts min 80mm max 150mm high, all chrome finish. 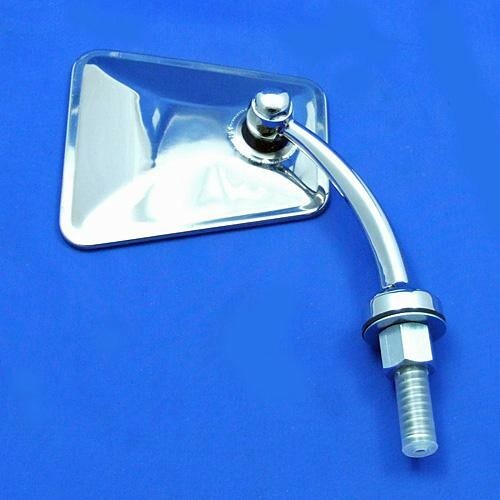 gutter mount type clamp on circular mirror which will fit to right side of vehicle. 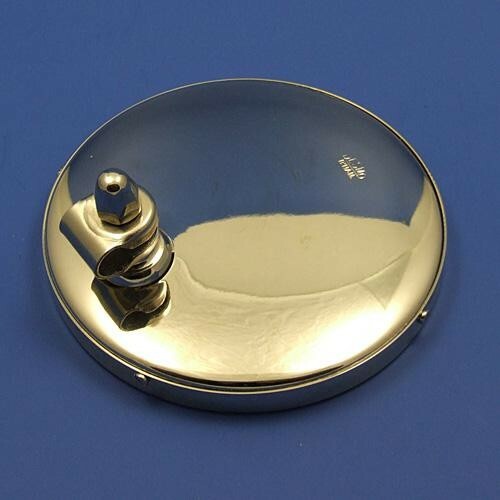 the head approx 78mm diameter, stainless steel back with flat glass, two screws nip the assembly to the right hand side of motor, to suit the left hand side the stainless steel bracket will require re-bending slightly. 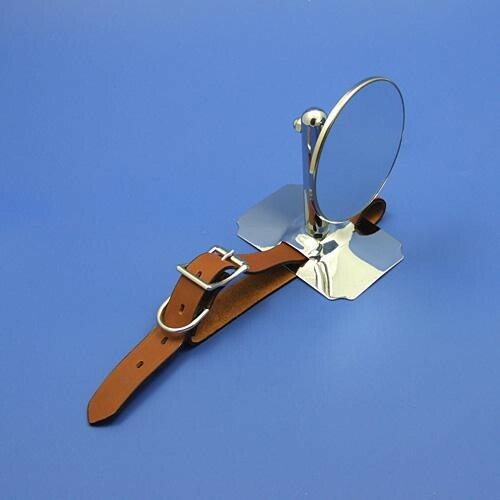 a useful 'peep' mirror. clamp on circular mirror which will fit to left or right side of vehicle. 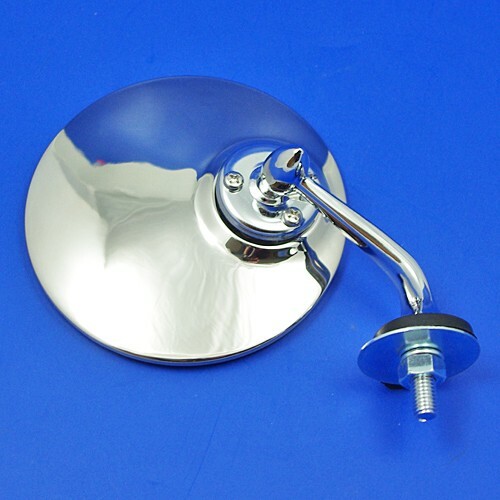 the head approx 78mm diameter, stainless steel back with flat glass, on curved chrome plated arm (approx 65mm) which clamps to the door edge etc. 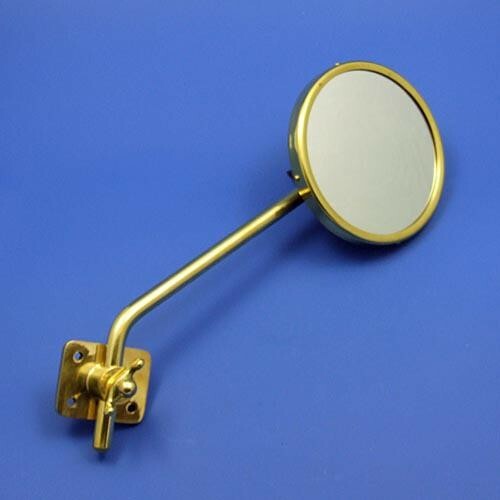 a useful 'peep' mirror. 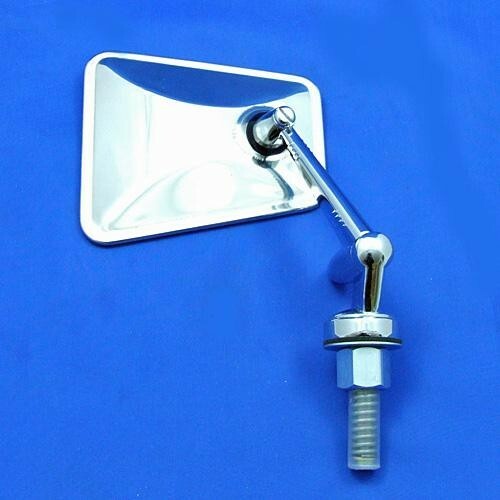 to adjust for fitting to opposite side of vehicle, the clamp bracket can be turned round. 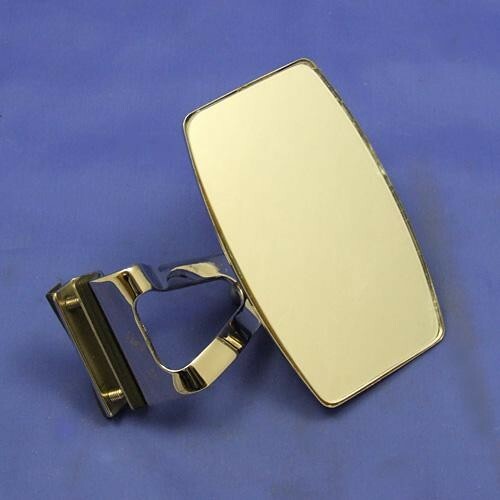 Original new/old stock Wingard 574 interior mirror, oblong flat glass with black mottle back (125mm x 50mm) mounted in a black crackle finish two piece clamp, stem length to the clamp centre 83mm with 41mm fixing hole centres. 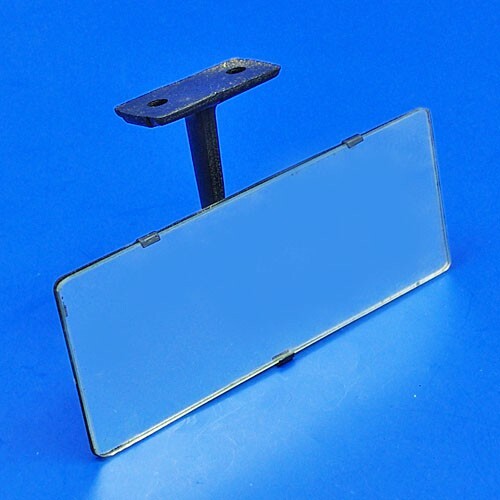 Original new/old stock Wingard 702A interior mirror, oblong flat glass (150mm x 60mm) mounted in a black crackle finish frame, stem length to the ball centre 70mm with 31mm fixing hole centres. 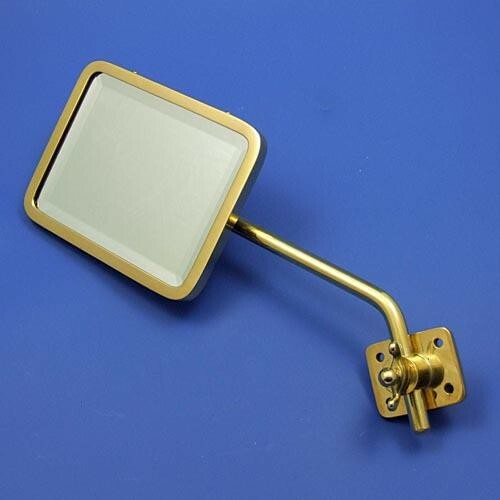 Original new/old stock Wingard 693A interior mirror, oblong flat glass (105mm x 42mm) mounted in a black crackle finish frame, stem length to the ball centre 70mm with 31mm fixing hole centres. 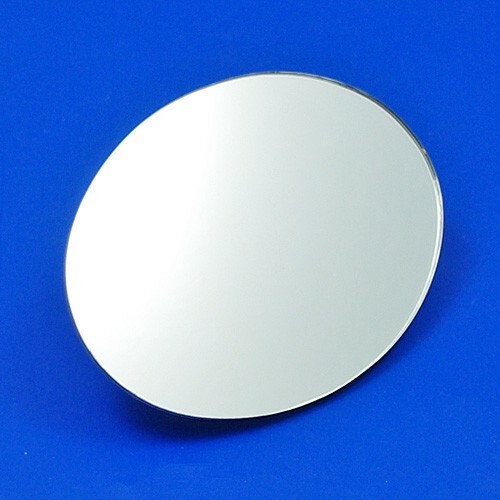 replacement convex mirror glass for Lucas type 160 (our 395) mirrors, 152mm x 75mm. 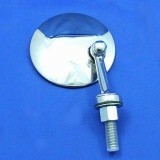 rounded lightweight alloy racing mirror with rim, 100mm dia, single 7mm approx bolt fixing, flat glass. base rivetted and rim held with screws. self colour. 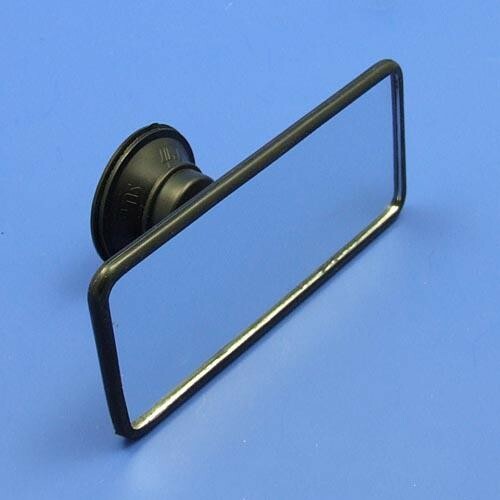 suction mirror for interior use on screen. 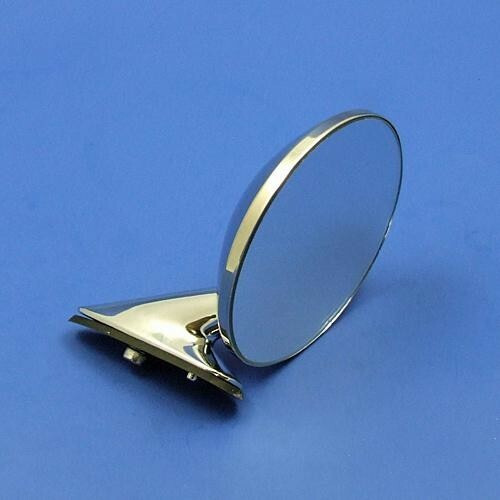 flat glass, stainless steel backing and edge rim 156mm x 63mm. 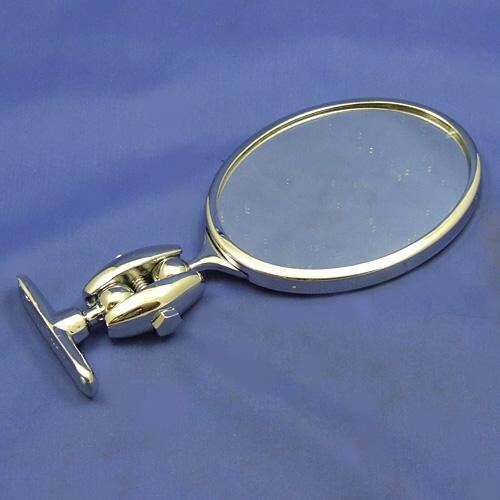 rectangular suction mirror, flat glass, with swivel adjustment. black plastic back and surround 156mm x 68mm. 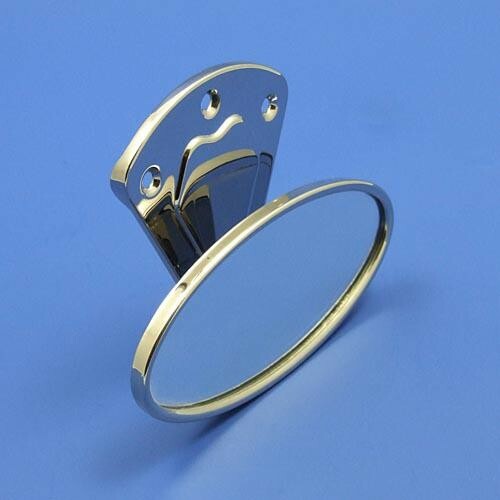 suction pad 53mm diam. 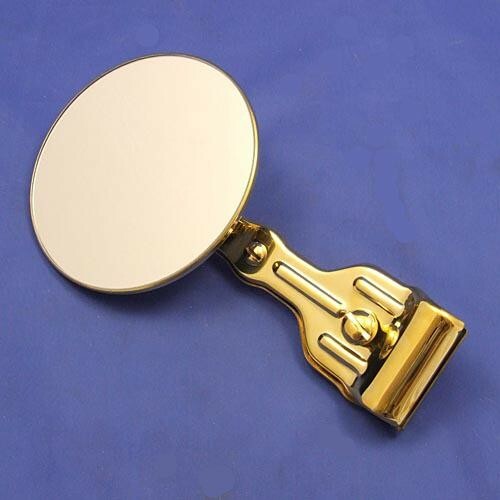 rectangular suction mirror, flat glass, with swivel adjustment. black plastic back and surround 120mm x 56mm. 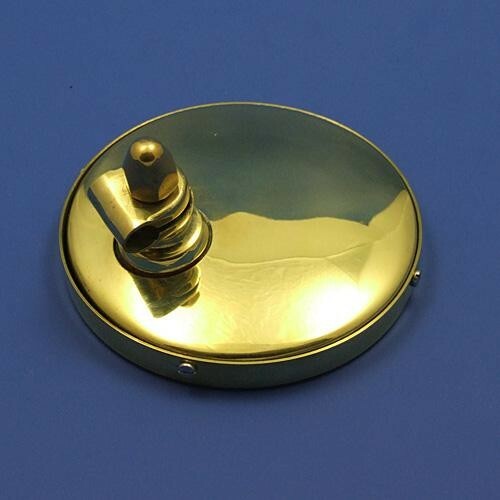 suction pad 53mm diam. 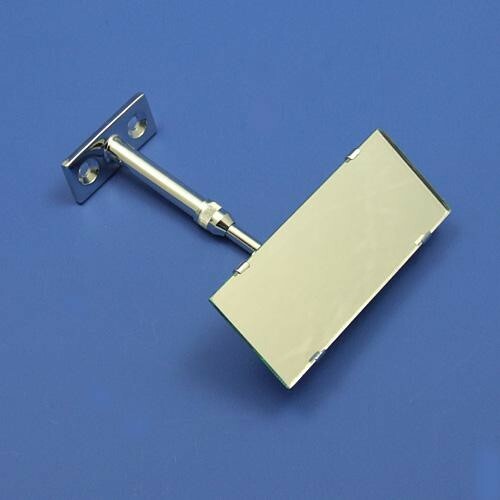 polished stainless steel backed interior mirror which clamps to rod of minimum 5mm diameter (not supplied). 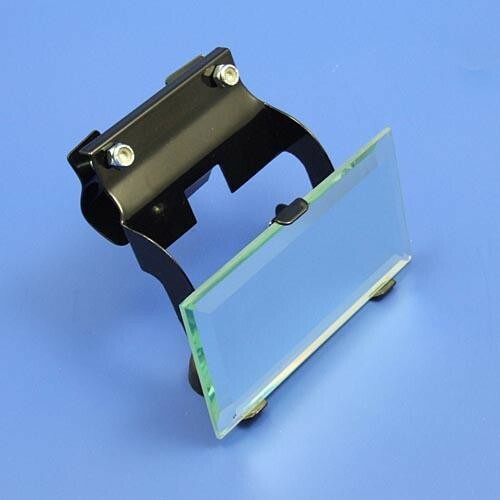 153mm x 56mm with flat glass. 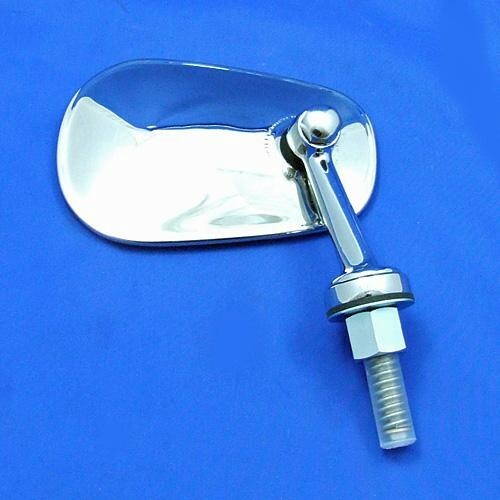 polished stainless steel bracket assembly which will clamp to top rail of open/tourer cars, to be held on by screw clamp. 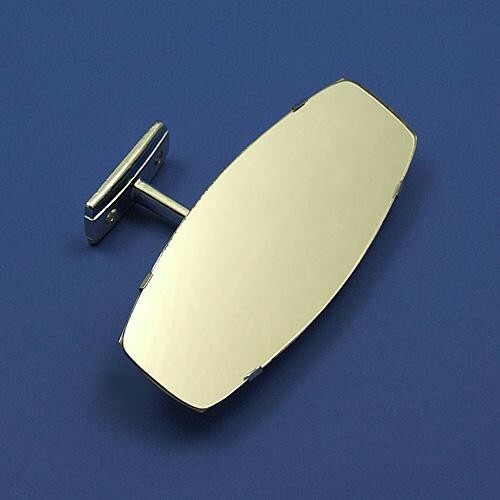 flat mirror glass with oval rim and back, approx 145mm x 73mm. 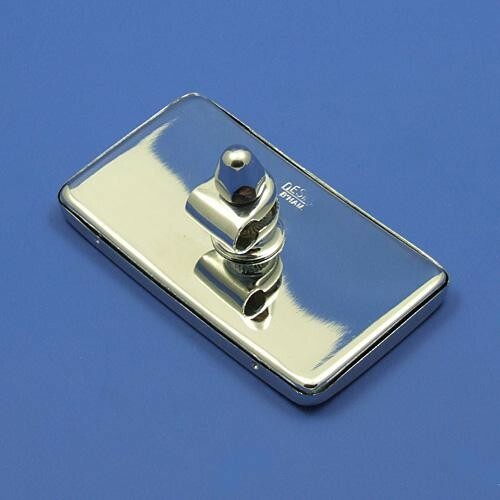 polished stainless steel bracket assembly which will screw to top rail in vehicle, base approx 93mm wide. 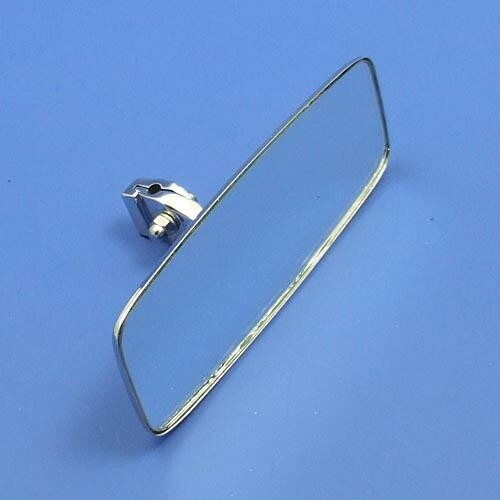 flat mirror glass with oval rim and back, approx 145mm x 73mm. 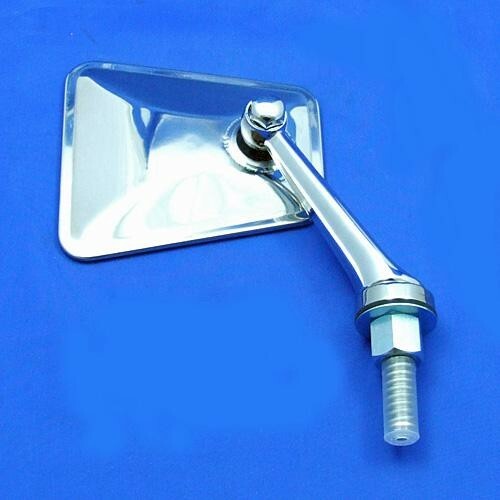 polished stainless steel bracket assembly which will clamp to top rail of open/tourer cars, to be held on by screw clamp. 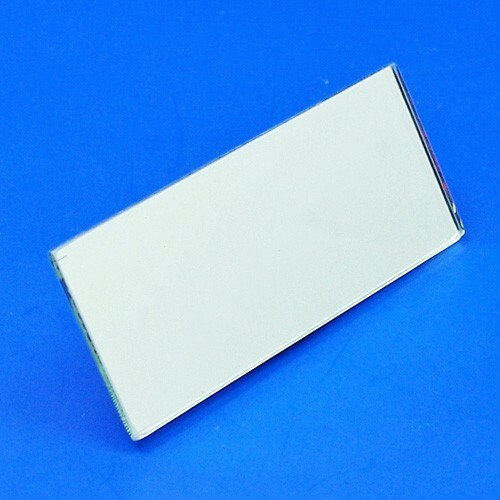 bevel edge flat mirror glass approx 130mm x 70mm. 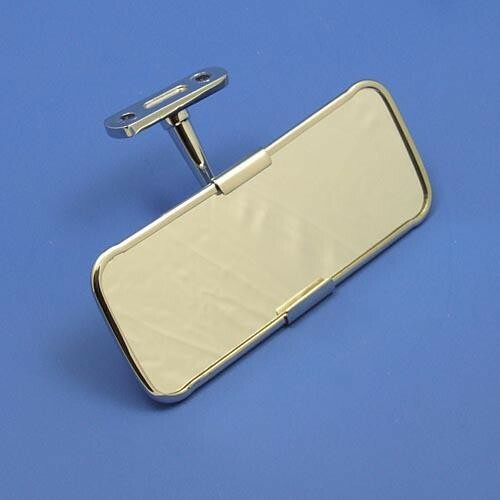 interior rear view mirror, polished stainless steel back. 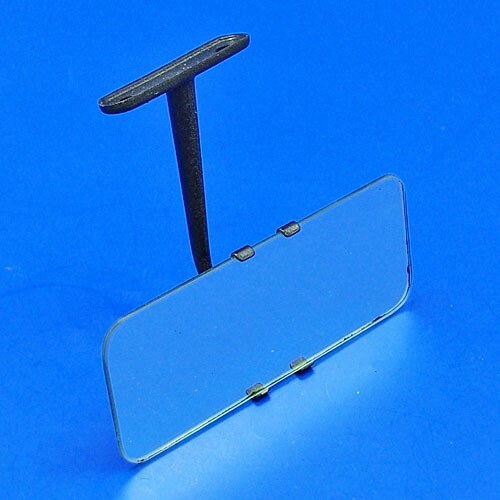 flat glass 172mm x 62mm. mounting arm approx 85mm high. (approx 105mm overall height). 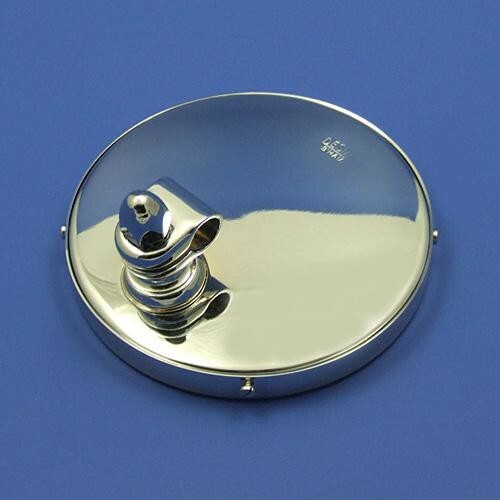 two mounting holes (36mm centres) in base 50mm x 25mm. arm leans away from screen. 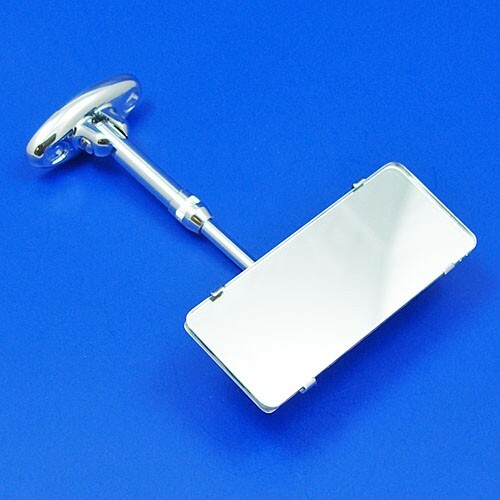 interior rear view mirror, polished stainless steel back. 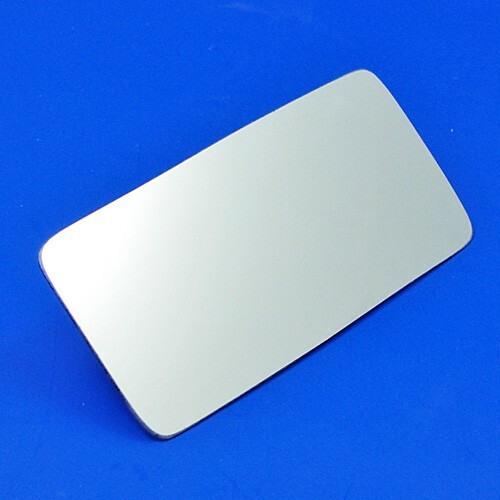 convex glass 127mm x 54mm. 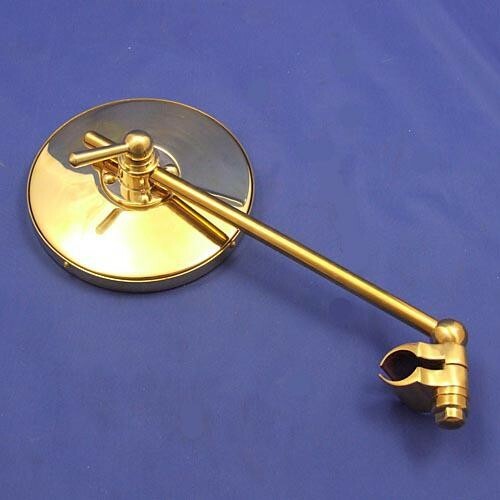 mounting arm approx 85mm high. (approx 100mm overall height). 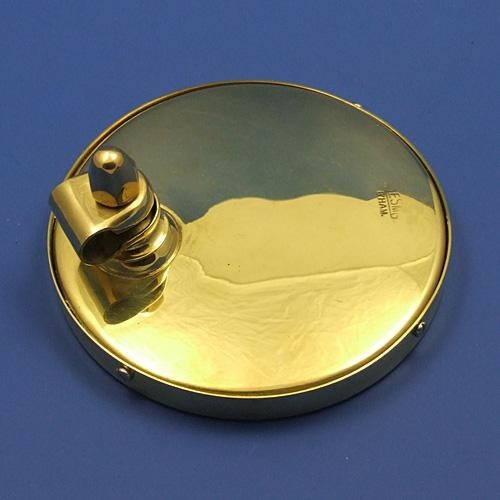 two mounting holes (36mm centres) in base 50mm x 25mm. arm leans away from screen. 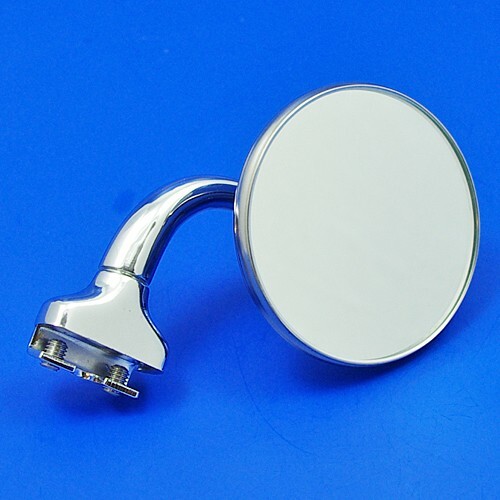 dash mirror on adjustable height stem. 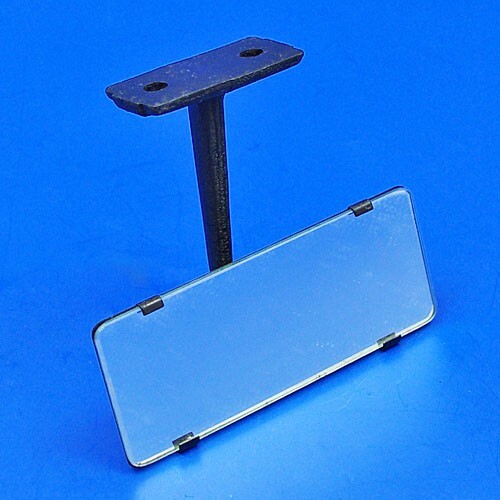 two screw base 51mm x 21mm (mounting holes 31mm centres), angled away from screen. 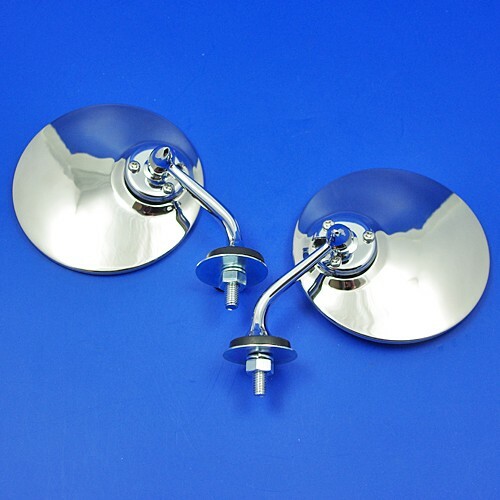 metal backed flat glass 105mm x 45mm, stem height adjusts min 80mm max 150mm high, all chrome finish. 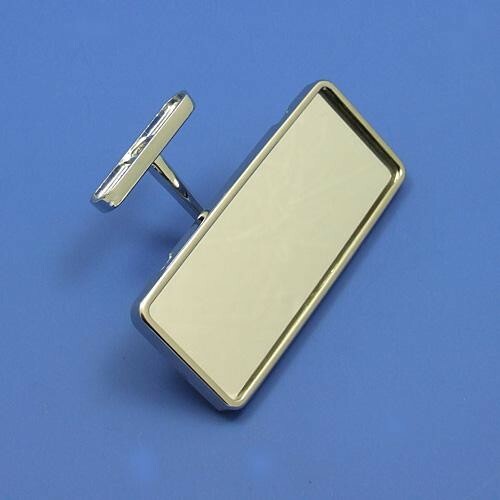 dash mounted Winguard pattern mirror, 2 screw base fitting 25mm x 53mm ,holes 31mm centres, all chrome, metal backed flat glass mirror 148mm x 60mm , 110mm overall height. 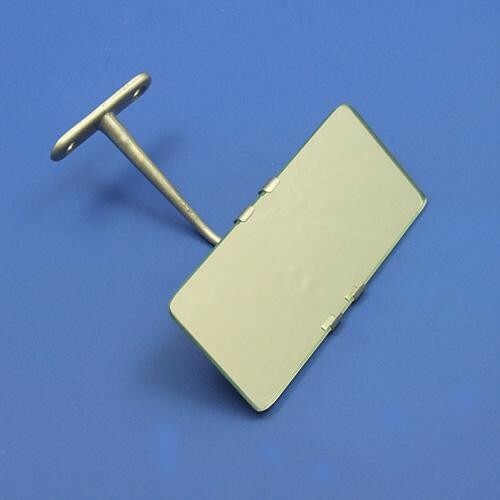 remanufactured interior rear view mirror as Lucas type 308. convex mirror glass 100mm x 43mm, two screw base mount as shown 40mm hole centres. 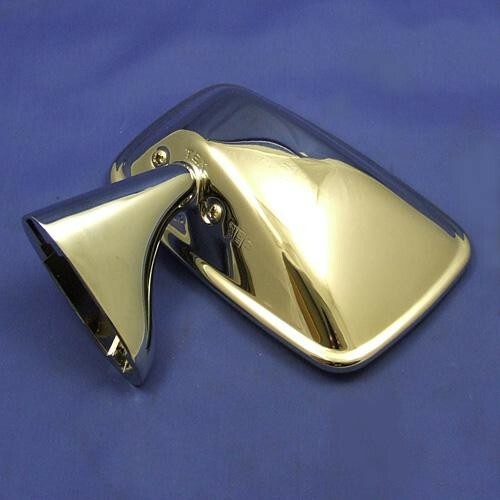 chrome on brass finish. overall height approx 117mm. 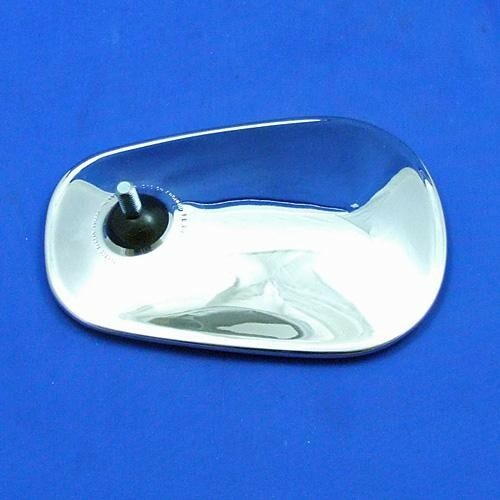 interior rear view mirror, stainless steel with chrome stem as fitted to MGA etc. 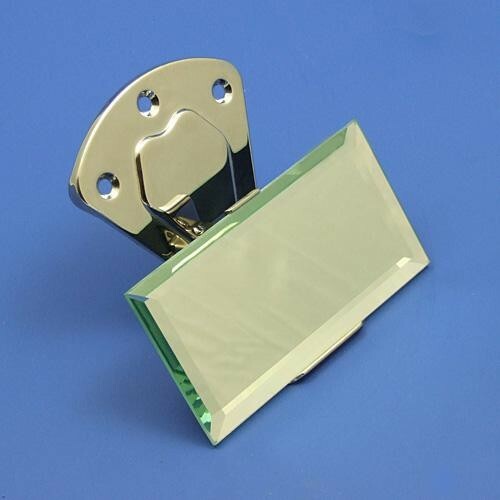 flat glass, head approx 130mm x 57mm with stainless steel outer protector edge. 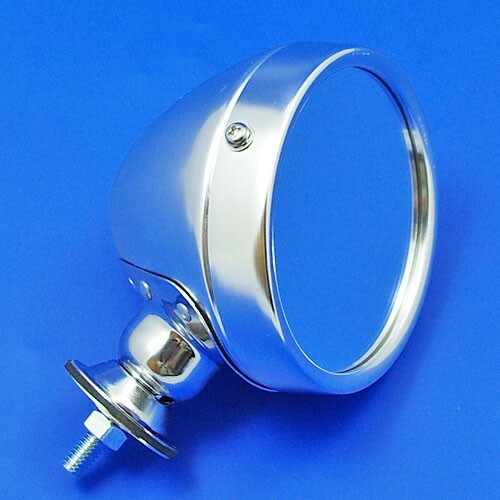 mounting stem base 58mm x 14mm with two mount holes 40mm centres. 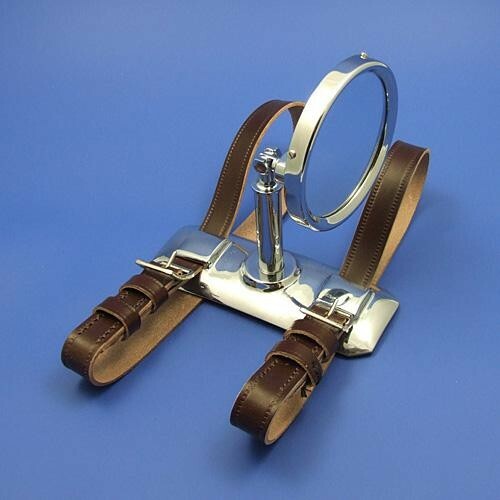 max overall height fitted 93mm. 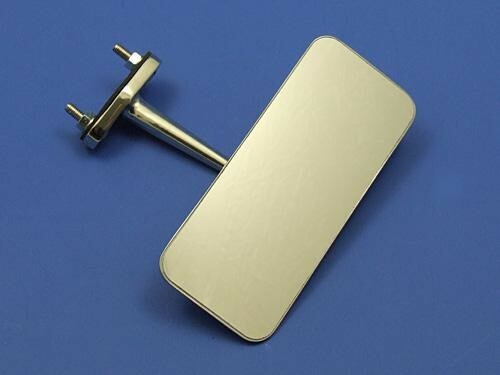 nice neat flat glass interior mirror with bevel edge 126mm x 65mm, glass held at top and bottom with stainless clamp which tightens with three screws onto the stainless steel mounting arm (80mm tall x 68mm wide) with 50mm hole centres. as original pattern, smoke grey paint finish, flat glass, for 100E and 103E. 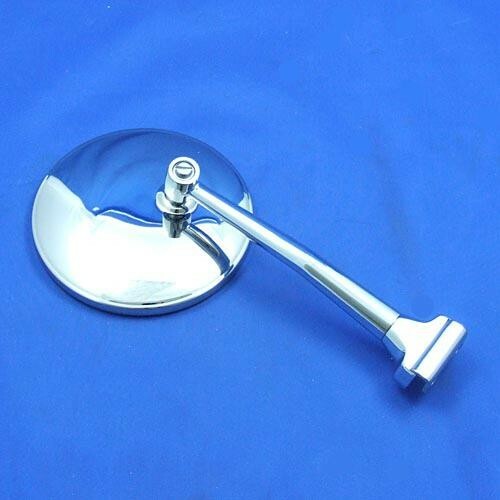 plain flat glass with ball clamp fitting to stem. 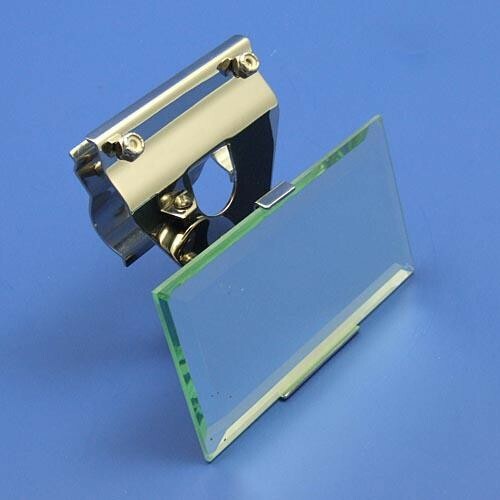 glass size approx 127mm x 56mm. overall height 123mm. 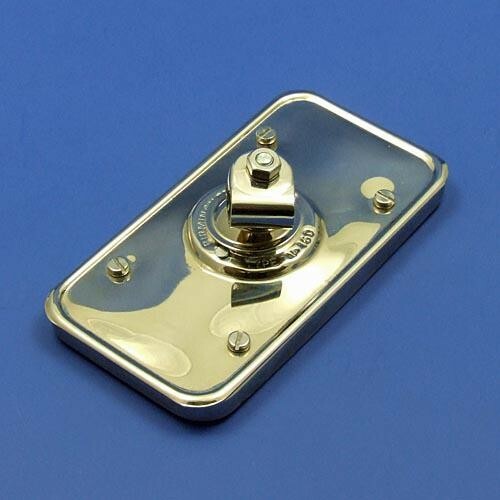 base size 59mm x 16mm with two screw holes 40mm centre to centre. 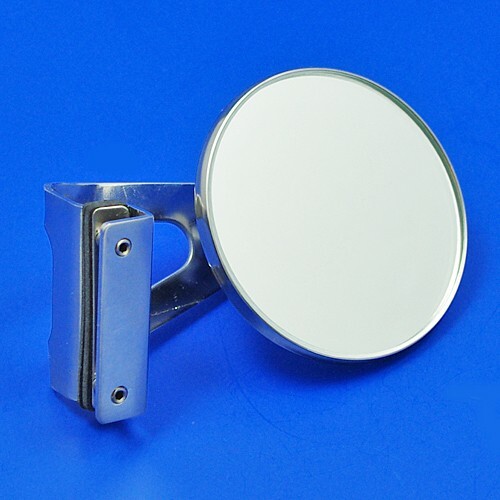 interior flat glass mirror on stalk, stainless steel rim and backing, chrome plate mount. 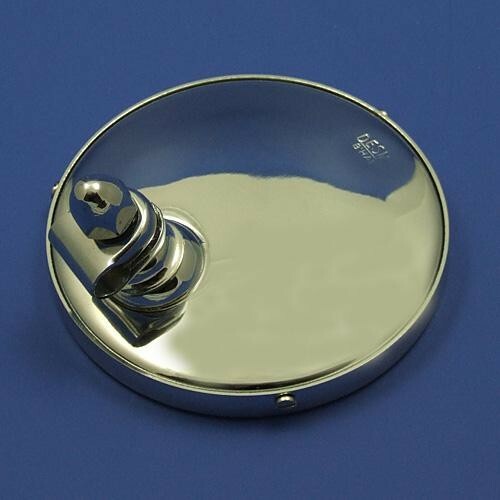 head 154mm x 62mm, overall height approx 95mm. base 58mm x 16.5mm, 38mm hole centres. please note plastic film needs to be removed from face of glass. 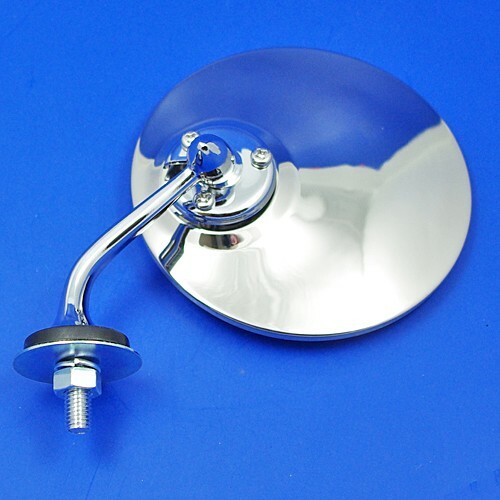 round mirror head on arm for mounting on to wing or door. single mounting bolt (requires 8mm panel hole) on shaped base (58mm x 18mm), chrome arm slopes out and toward rear. 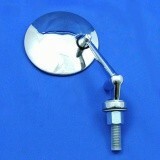 polished stainless mirror head with convex glass approx 112mm diameter. supplied in pairs only. 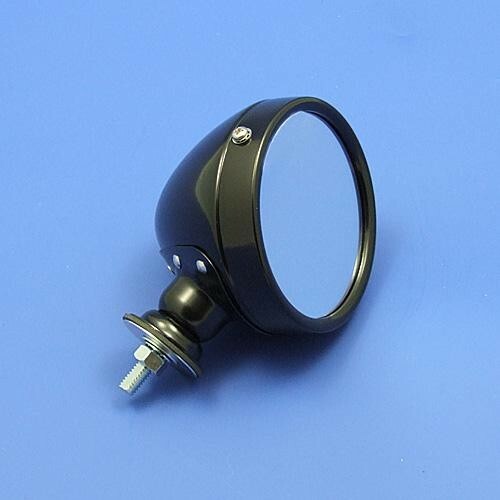 rounded lightweight black finish alloy racing mirror with rim, 100mm dia, single bolt fixing, flat glass. base rivetted and alloy self colour rim held with screws. 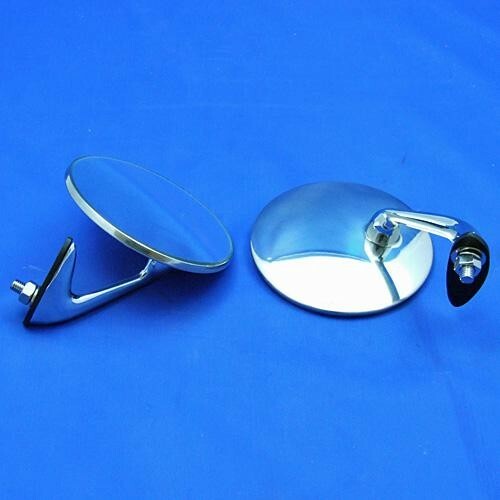 spare wheel mounted rear view mirror, chrome 115mm dia flat glass, complete with leather strap 560mm long. 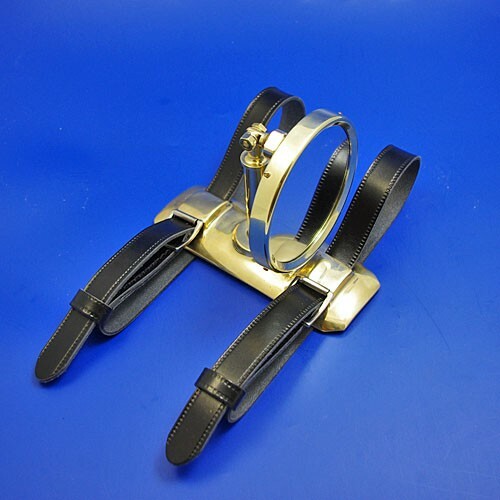 longer leather strap available if required at extra cost. 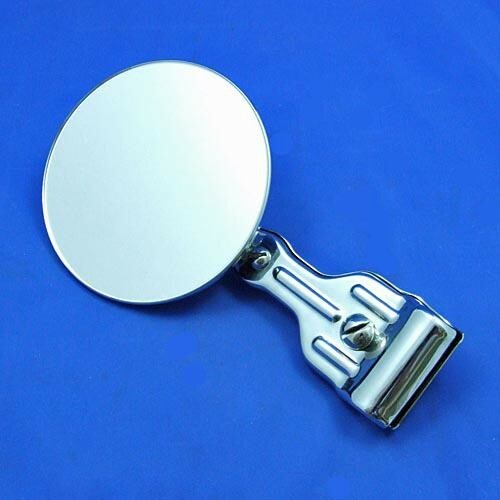 round lightweight alloy racing mirror. 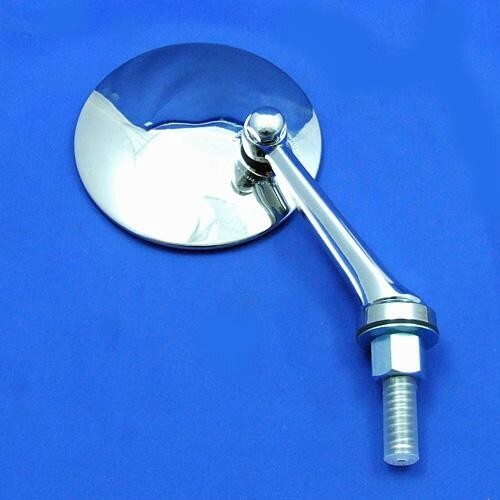 100mm diameter, 90mm deep, single bolt fixing at base. flat glass. 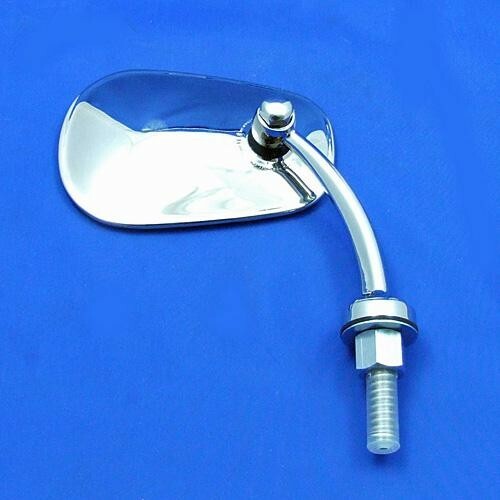 wing mounting racing mirror, polished alloy, 100mm diameter, convex glass. aerodynamically styled, fully adjustable and vibration free. 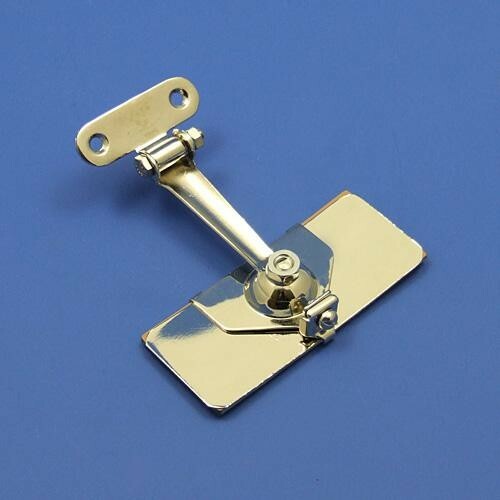 110mm long, two bolt base 93mm x 27mm (mounting hole centres approx 51mm). 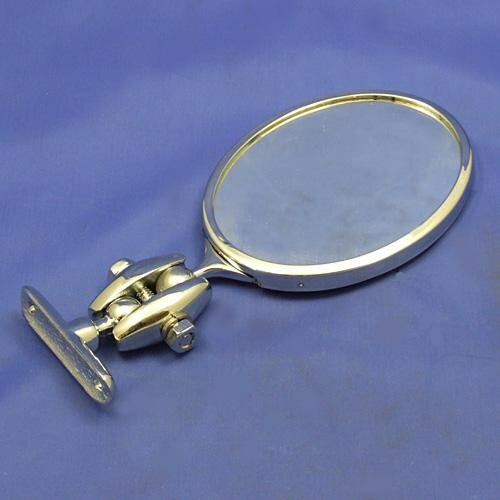 new unused original stock part of Rallye classic outside mirror. manufactured by Vitaloni of Italy. 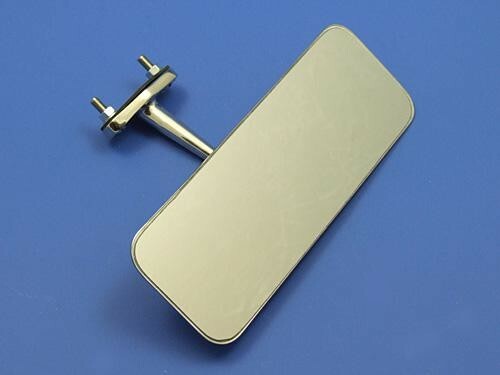 this mirror is for the LEFT side of vehicle mounting only (right hand side was not considered at this time) and it will not transpose to mount on other side. 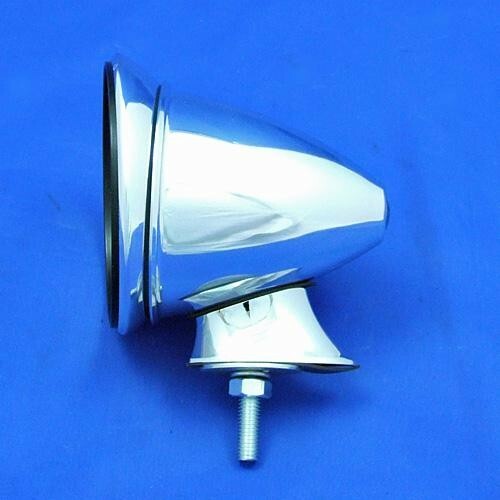 chrome plated classic angular shape body with flat glass. size 124mm x 85mm x 93mm deep. 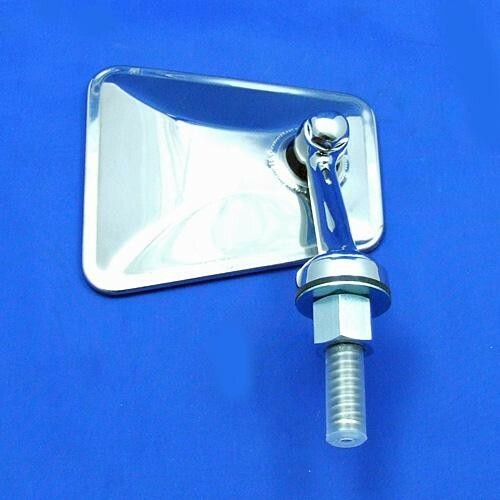 flat mounting base 35mm x 67mm with two bolt holes 52mm apart. 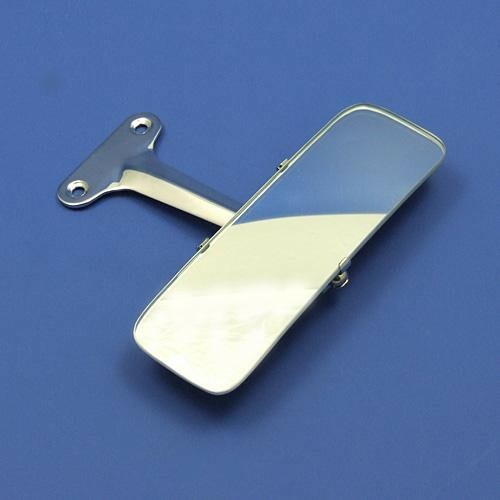 polished aluminium racing mirror, 98mm diameter x approx 98mm depth. 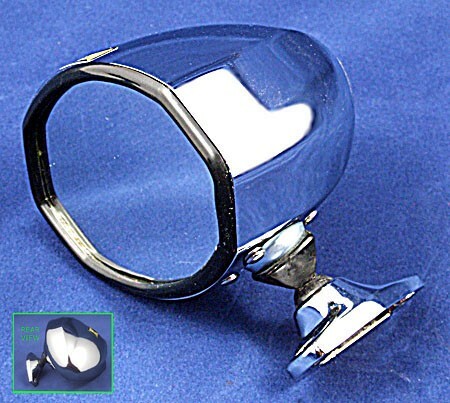 convex glass lens held in adjustable holder with screw adjustment. 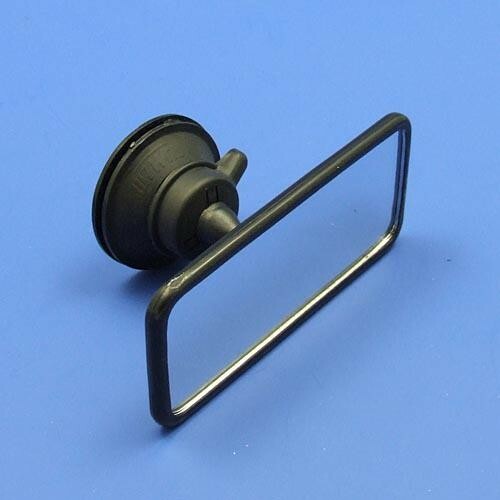 single bolt (8mm diameter, 30mm long) mounting on base 57mm x 20mm with rubber gasket. 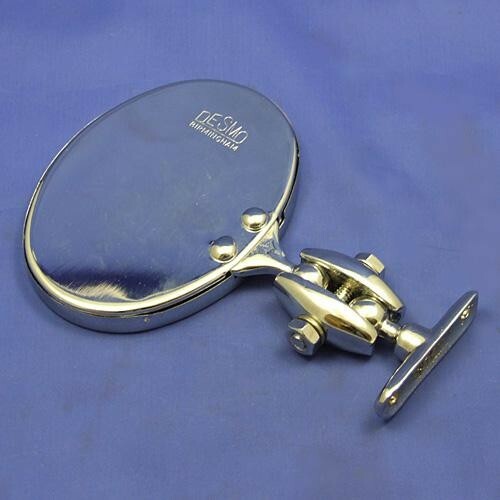 oval arm mounting mirror marked Desmo, size 110mm x 82mm, fitted with clamp for 3/8" (10mm) arm. 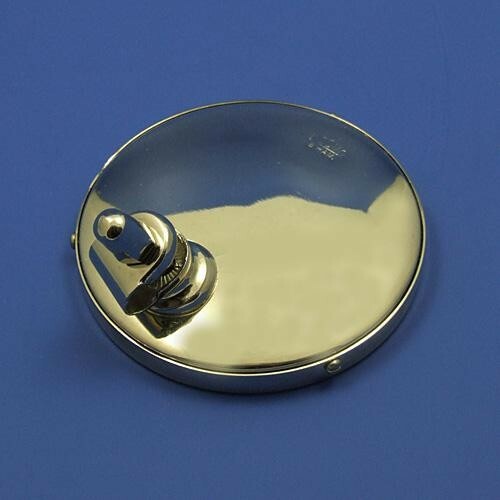 available chromium or nickel plated finish, or polished brass. convex glass. 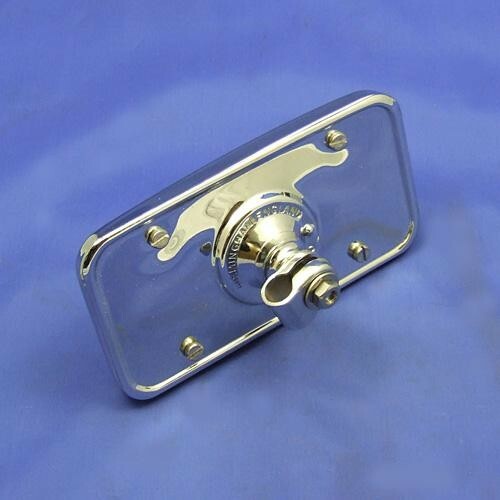 Desmo stamped to suit left or right mounting. 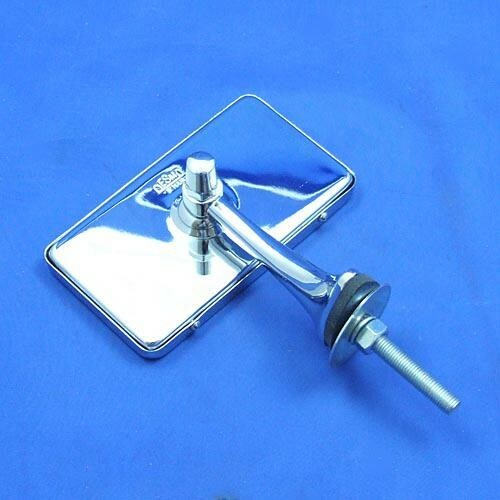 ITAL exterior door mirror, polished stainless steel head with convex glass 113mm in diameter mounted on a chrome plinth with single bolt fixing and locating peg, (centres approx 29mm) supplied with rubber gasket, mirrors footprint 90mm x 30mm at widest point. 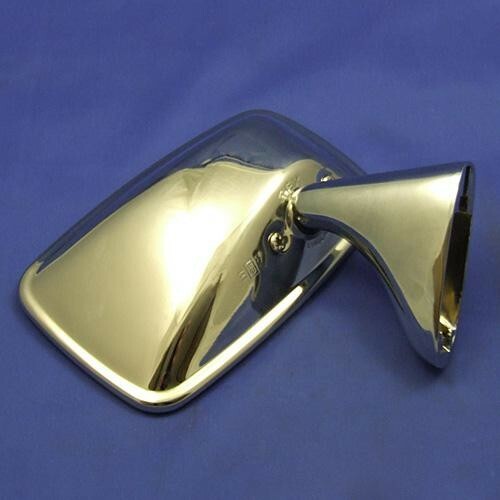 can be used as a wing mirror. 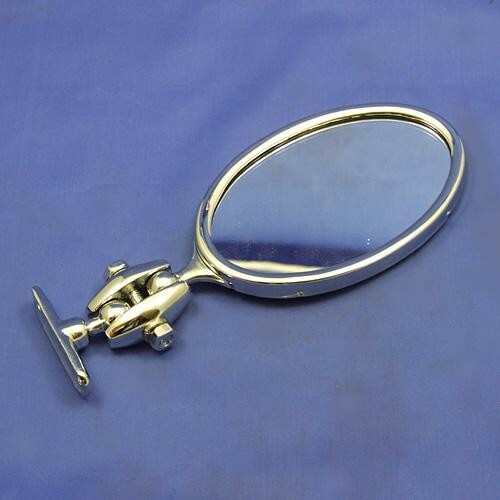 oval type exterior mirror with flat glass suitable for vehicles of the '30's, size 128mm x 81mm (overall length 196mm). 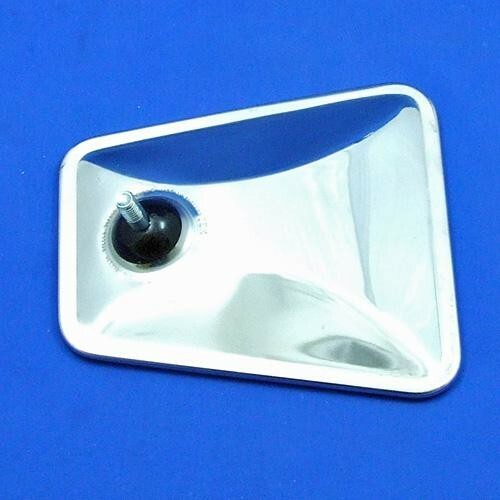 complete with concave base mounting bracket 58mm x 14mm, hole centres 43mm approx. 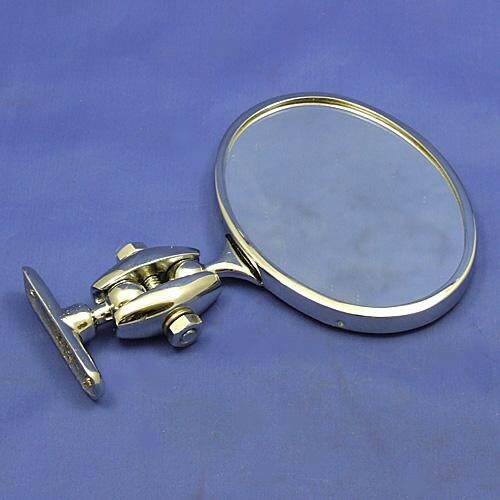 note detail to mounting edge of rear of mirror. 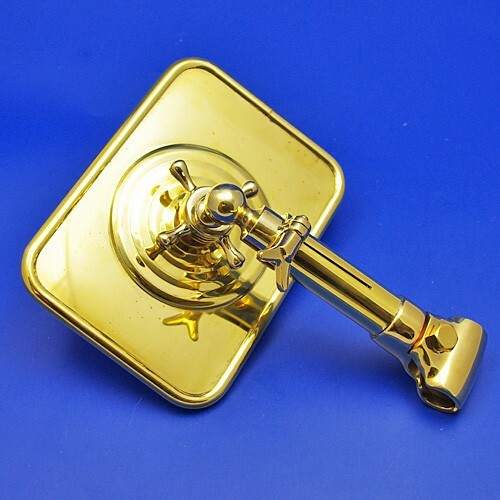 brass/bronze construction, chromium finish only. 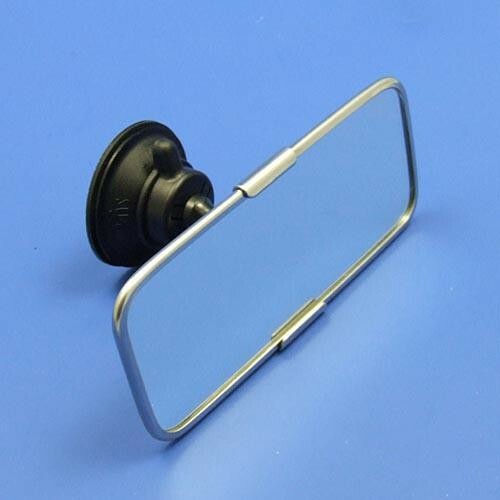 single mount flat glass rear view mirror. 160mm x 82mm flat glass with chrome surround and back. overall height 120mm. actual arm is 75mm tall (to mirror bolt). 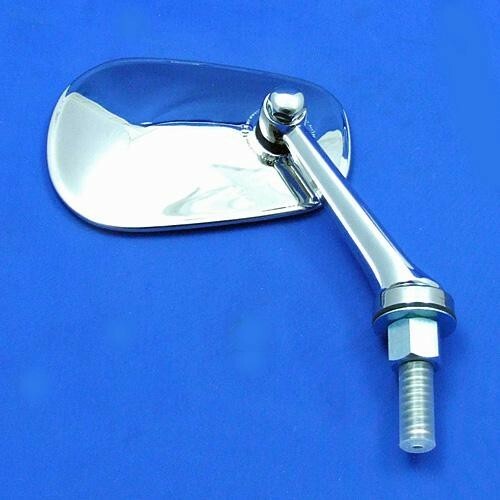 dash mounted mirror with single bolt fixing 110mm x 65mm. 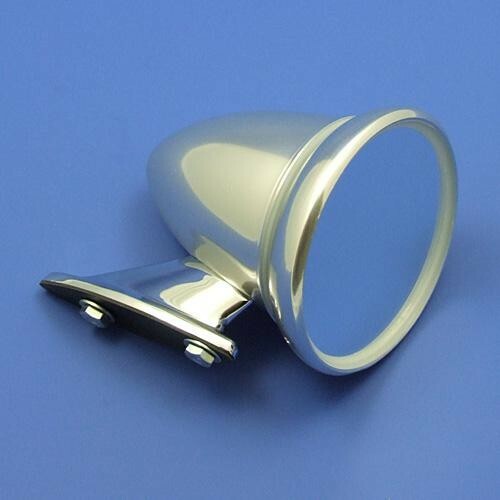 chromium finish, 120mm overall height, 'Desmo' pattern. 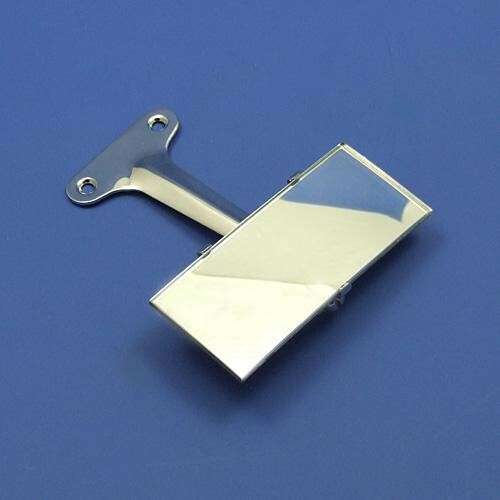 used on several sports cars including MG.
gutter mount type clamp on stainless steel mirror. 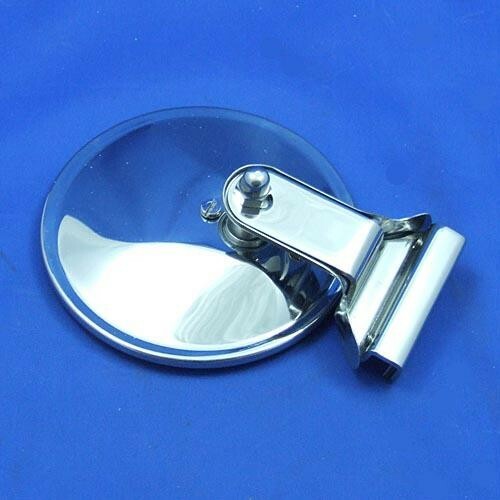 convex glass 115mm x 73mm with stainless steel back and bracket. 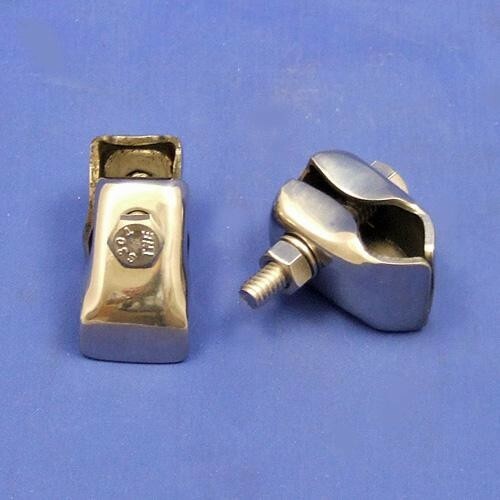 two screws nip the assembly to the right hand side of motor, to suit the left hand side the stainless steel bracket will require re-bending slightly. 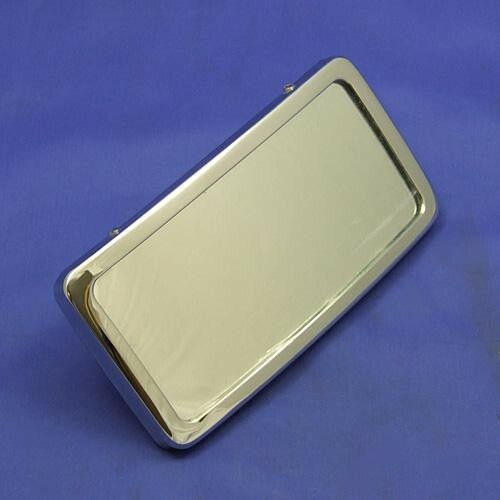 chrome finish (clamp to door frame edge) stainless steel outside mirror. 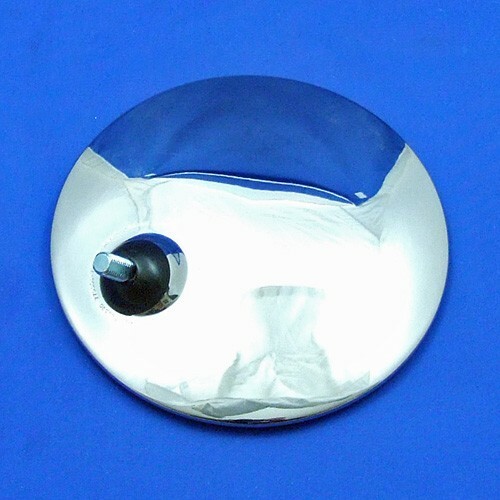 flat glass head 111mm diameter, on arm approx 135mm long. 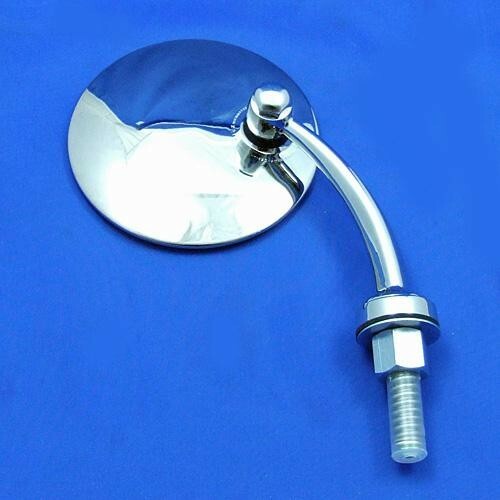 adjustment to mirror head angle is by slackening a screw in the arm. base measues approx 36mm high x 19mm wide on the outside area. will grip on to max 4 to 5mm . 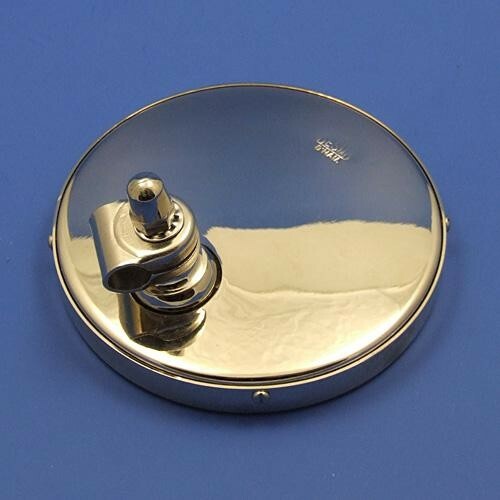 note that the actual grub screw base is itself held on the the chrome base casing with another screw. 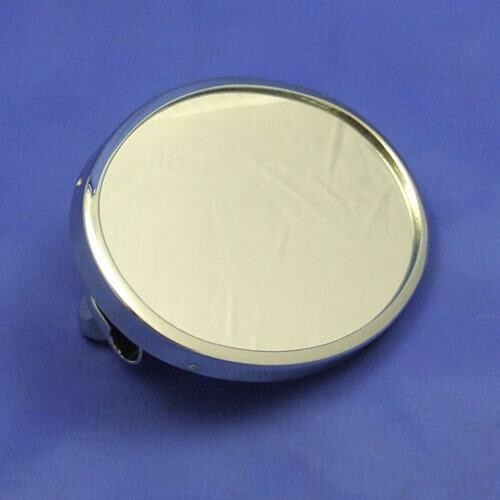 polished stainless steel clip-on mirror with circular convex glass, 102mm diameter. 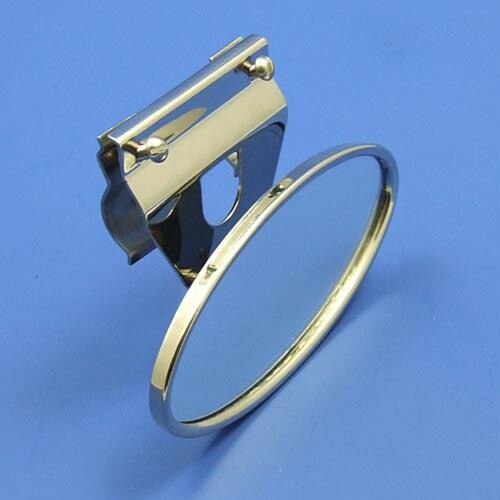 stainless steel clamp brackets suitable for several uses when a plate need be fixed to a round tube. 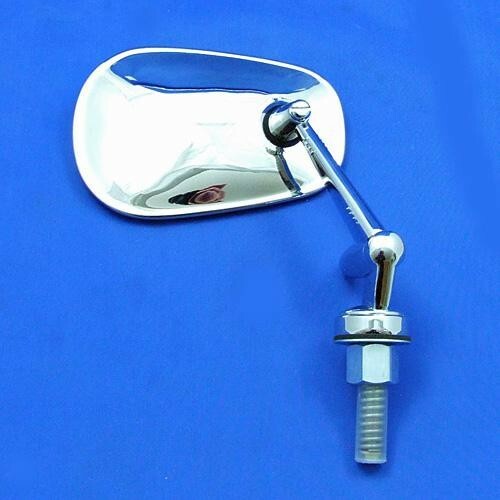 1/4" (6mm) bolt, round bar size minimum of 19mm - maximum on 25mm diameter. offered in set of two complete units only. 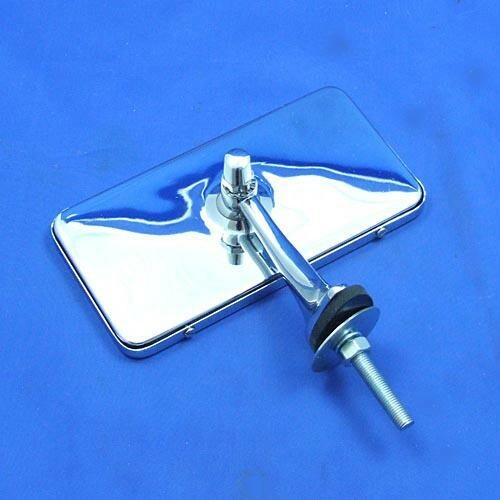 particularly suitable for rally plate, number plate etc.